Here we are, ready for another challenge to help us make money from home. As you know – we're working our way through 365 ways to earn an income from home. And today we're gonna talk about GigBucks.com. Some of you may have heard of Fiverr.com. It's a site you can go to and be paid $5 for performing a task. Maybe it's writing something, or making a video – there are so many different tasks that people offer. And they do them for $5. Which is all well and good – but ya know…. sometimes you have something to offer that might be worth more and SHOULD be worth more. But you're stuck with just that $5 limit. This is where GigBucks can change the game for many of us. With the pay increase of up to $50 – you can see where this can become a much more lucrative venture for your time and efforts. Maybe you're someone that does genealogy or maybe you create logos – it's wide open for all kinds of skills – and you can get paid more which makes those of us on the services end much happier. There are many different categories of services – including writing, videos, programming, graphics and even silly stuff. Once you've decided what you're going to offer – you can set up your profile (for free) and begin promoting it/you. And if you decide there is a product you are wanting to sell – you can add shipping costs into your final cost to the seller. Almost like eBay in a way. So it's made even easier for those wanting to sell an actual tangible item. Of course, many choose to sell something they can email or provide virtually. If it were me – that's what I would do as well. I don't want to have to mess with selling a product – I'd rather sell something I wrote or a report — but that's because that's what I am comfortable with. Others might have a lot of experience with selling products and finding wholesale items – even buying items in bulk. How Can This Be an Income? Offer something worthwhile. Let's start there. Maybe it's super silly and unique. Maybe it's something that really does take a trained effort or art – whatever you choose, once you start getting buyers, you're little GigBucks business is going to live or die by feedback. Just like anything else. The more positive feedback you get – the more you're going to see your business grow. There is no cost to you. There are no expenses really at all. You're not having to set up an office somewhere, there is no real overhead. And when so many people are wanting to know how to make money fast – well, I'd say this has that real potential. Maybe you have a pretty cool talent that you never really thought would take you anywhere, let alone make you some nice cash. There are endless ideas. You just need to create YOURS and be the best at it. Even if you figured something you're really good at – sold it for $20 a pop, you'd make $100 a week doing the service 5 times or selling the product 5 times. This is a way to totally make money online. Maybe you need special software if you're going to make videos, or you have to buy the product you're selling and then mark it up — I would think in the end, the cost of whatever you're doing is really your time. How much is it worth? Join the crowd at GigBucks and cash in with your talents! 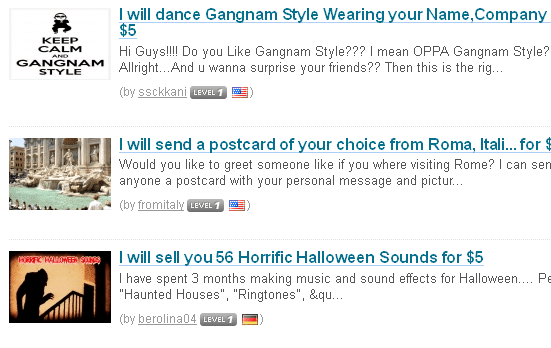 Someone might come to a site like GigBucks and think… these are all weirdos doing stupid stuff. No… give the site a good look over. There are regular people just like you and me that have been smart enough to figure out what they can offer, do that well and price it right. They are now making some nice cash with their online business. So don't just make an assumption – look it over well. Then think about how you can get in on this action. This is one way to make money from home that really opens the boundaries and limits. What do you think about GigBucks as a way to make money from home? Is it something you've tried or want to try? Be sure to comment below and let's start a discussion! I earned $90 by working hard on gigbucks. They have an issue with clearance. After clearing the money they hold the money without any reason. At last i saw that all the completed and well rated projects are marked as “Admin Cancelled” and they took away all the money. The buyer has rated me 100% positively. I contacted with them and they told me the buyer complained. Even i know nothing. I have given a lots of proof that my works are 100% okay. But they are cheater and cheating with everyone. They will take your money after a few days passed. I observed and found that, the admin create accounts and acts as a buyer. He buys projects from sellers, get his/her works done, gives seller 100% positive rating. But you will never get you money. They will give an issue and take your money. Have anyone such experience like me?? ?